Interested in the badges and ribbons? Increase your online engagement and collect badges based on participation or connection. Increase your online engagement and advance to the next level with each vHero badge! Do you have what it takes to earn a Cosmic badge? Members were invited to submit a design that best represents their local community. Join the local community to receive the badge. Stay tuned…more ribbons coming soon! Are you missing a ribbon or badge? 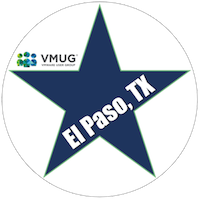 If so, send us a message at memberservices@vmug.com.